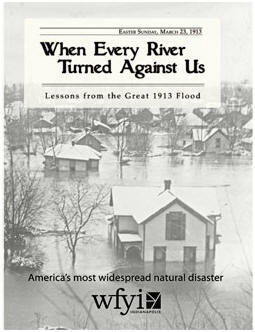 The Great Flood of 1913 was America’s most widespread natural disaster, overshadowing Hurricanes Katrina and Rita in 2005 and Hurricane Sandy in 2012. Hardest hit was Indiana. And yet, the flood remains largely forgotten. On Monday, July 13, the North Manchester Historical Society will revisit this disaster in its regular monthly program at 6:40 p.m. in the Assembly Room of Timbercrest Senior Living Community, 2201 East Street. The program will begin with the Indiana Historical Society video, “When Every River Turned Against Us.” Manchester University Emeritus Professor of History David Waas will then connect the larger story to how the flood affected North Manchester and Wabash. Waas is a very popular lecturer and scholar. Teaching at MU from 1964-91 in American and World History, especially African History, Waas also taught at Western State, Otterbein, UCLA and the University of Malawi. His BA was from Manchester College and MA and PhD from the University of Illinois. Waas has travelled extensively, teaching for Semester at Sea three times, circumnavigating the world each semester He has lectured as a Roads Scholar, lectured on many ships cruising to different parts of the world, and conducted seminars on Africa for US teachers for the US Department of Education. 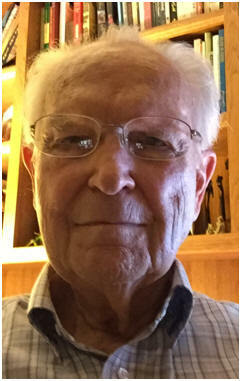 He may be best known to the North Manchester community for conducting NewsTalk for Shepherd's Center for 30 years. There is no cost for the program, which is free to the public. All are welcome. While many attend only the program, the public is also invited to come to the Assembly Room at 6 p.m. for a meal prior to the program. For those who wish to attend the dinner, reservations must be made no later than noon on Friday, July 10. The cost of the meal is $8.50, $3.50 on the Timbercrest meal plan. Reservations may be made by calling Evelyn at 260-982-6777, Mary at 260-982-1813 or the Center for History at 260-982-0672. 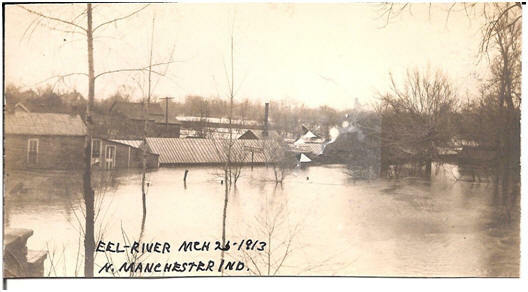 Eel River flood in North Manchester, March 26, 1913. From the North Manchester Historical Society Archives. 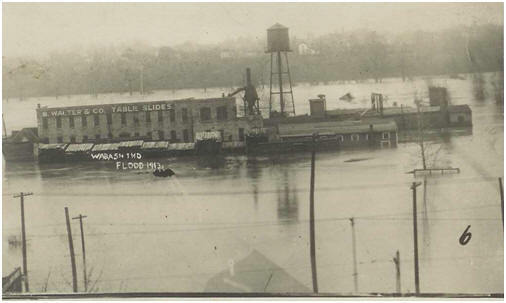 Wabash River flood in Wabash, March, 1913. From the North Manchester Historical Society Archives. Manchester University Professor Emeritas David Waas. Video that will be shown on July 13.